A 3-in-1 makeup stick that applies like a cream and wears like a powder for weightless color, contour and highlighter that can be worn on lips, cheeks and around the eyes. Meet the ultimate multitasker. The Multistick is made to use anywhere on the face, from lips to cheeks to eyes. With 35 percent powder, this silicone-free, clean makeup stick creates a soft focus finish that's breathable, blendable and buildable. Its spectrum of universally flattering shades look beautiful anywhere on the face and on all skin tones, providing the perfect wash of color when applied as a lipstick, blush, eyeshadow, contour, or even highlight. Plus, it’s effortless to use—just apply it with fingers or a brush. 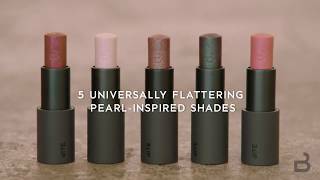 Like all Bite Beauty products, The Multistick is handcrafted by Bite Beauty at the brand’s facility in Toronto, and is made with natural and organic ingredients. From “no makeup” makeup to monochromatic looks, experience simplicity on the go and flawless versatile color, all in one. Apply The Multistick on lips like a regular lipstick, and on cheeks and around the eyes with fingers like a cream shadow or blush. The Multistick can also be used to contour lips, cheeks and eyes. #TheMultistick is breathable, buildable, blendable color for eyes, lips, and cheeks. 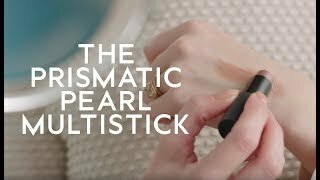 Use the Prismatic Pearl Multistick for a glossy lid look or duochrome highlight. Glow bright against winter light with instant, mood-lifting pearl color. 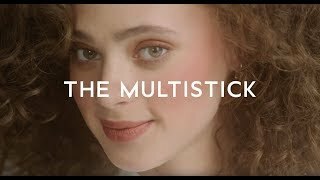 The Multistick is rated 4.4 out of 5 by 34. Rated 4 out of 5 by Katherine from Fun I have this in rose pearl and cashew. I would not recommend using rose pearl anywhere you don’t want glitter for a few days. That said this color is awesome over any other lip color or by itself for some fun. The mulistick blends out really well on cheeks and eyes. I did notice that it got weird in the crease of my hooded eyes even with primer, a light dusting of powder, and setting spray. The cashew has a nice matte application to the lips that looks more natural and is not drying with low transfer to coffee cups and baby cheeks. And the tube the multisticks come in has an awesome magnetized closure that I am in love with! So satisfying!! Rated 5 out of 5 by nogaleslv from YouTube Review Purchase Success I bought this product because my favorite beauty blogger suggested in on YouTube. I was looking for a cream based shadow I could just throw on in the morning before work and still go into the office looking polished and put together. This is a winner. The formula glides to easily onto the eyelid and is easy to spread out with a brush or fingers. I have even added a transition shade into the crease on top of the multistick and it makes everything more pigmented and beautiful. Will definitely be repurchasing in more colors! Rated 5 out of 5 by EvieM from Amazing, Unique Product I’m 67. I had a really good facelift, years ago, so people often tell me I look like I’m in my 40’s, but you can’t fake young skin. I spent too many years in the sun, and my skin shows my bad choices, so powdered eyeshadow often accentuates the not-so-tight, aged skin on my eyelids. I received a sample of this stick, in Cashew. It changed my life! I use it for eyeshadow, blush, and lipstick, and it is a beautiful, natural look, that never looks cakey on my eyelids, and replaces half of the items in my travel bag...a huge plus. I have blonde hair and green eyes, and the Cashew is the perfect color with my pale skin tone, but the Gelato color, more rose-mauve on me, also works. LOVE. Rated 4 out of 5 by e8ishop from Peacock Pearl is a great lip gloss... Peacock Pearl creased on my eyelids, and it is too sheer to be an opaque lipstick, but it is an amazing lip gloss/topper. As a lip gloss, it isn't streaky at all, it is moisturizing, and it is up to the standard of the Bite Beauty lipsticks. I can wear it all day without streaks or the need to re-apply. Disappointed by the sheerness at first, but the evenness, the moisture, and the wearability totally makes up for it. Just manage your expectations! Rated 5 out of 5 by Holly from Fantastic Product Great for aging skin. Goes on easy, blends well, and lasts! Rated 5 out of 5 by BHart from Love these I really love these multisticks. They are very pigmented yet easy to blend and sheer out or build for a more dramatic look and have good staying power. I have these in Cocoa, Cashew and Marscapone so far and love all 3. Cocoa is perfect on my eyes and with a light hand can be blended out as a contour. Cashew is a pretty neutral and Marscapone is a beautiful pink cheek and lip color. On the lips I use these over the lip mask as a gloss. They aren't drying but they do apply matte and I find matte lips aging and unflattering on almost everyone over 25. These are long-wearing and I have no issues with creasing on the eyes. I dont wear a primer but I do even out my lids with a touch of concealer and apply with my fingers. Lasts all day for me this way and doesn't emphasize texture/crepey skin. Rated 5 out of 5 by Kemi from Versatile I love the Bite mulitsticks!! I use as eyeshadow, blush and lipstick. The colors are so rich and concentrated! !